In a digital laboratory on the shores of Puget Sound, a band of virtual reality researchers race to complete the Cavern, an empty white room that can become a jungle, a painting, or a vast Byzantine cathedral. In a war-torn Mediterranean city, an American is held hostage, chained to a radiator in another empty white room. What can possibly join two such remote places? Only the shared imagination, a room that these people unwittingly build in common, where they are all about to meet, where the dual frames of this inventive novel to coalesce. Adie Klarpol, a skilled but disillusioned artist, comes back to life, revived by the thrill of working with the Cavern's cutting-edge technology. Against the collapse of Cold War empires and the fall of the Berlin Wall, she retreats dangerously into the cyber-realities she has been hired to create. As her ex-husband lies dying and the outbreak of computerized war fills her with a sense of guilty complicity, Adie is thrown deeper into building a place of beauty and unknown power, were she might fend off the incursions of the real world gone wrong. On the other side of the globe, Taimur Martin, an English teacher retreating from a failed love affair, is picked up off the streets in Beirut by Islamic fundamentalists and held in solitary captivity. Without distraction or hope of release, he must keep himself whole by the force of his memory alone. Each infinite, empty day moves him closer to insanity, and only the surprising arrival of sanctuary sustains him for the shattering conclusion. 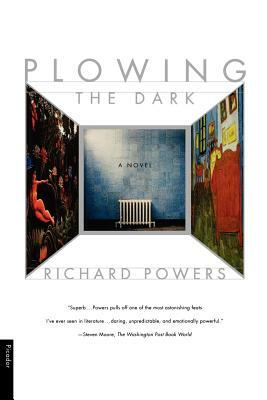 Plowing the Dark is fiction that explores the imagination's power to both destroy and save. Richard Powers is the author of several novels, including The Echo Maker (FSG, 2006), which won the National Book Award and was a finalist for the Pulitzer Prize. Powers has received a MacArthur Fellowship, a Lannan Literary Award, and the James Fenimore Cooper Prize for Historical Fiction. He lives in Illinois.